"I want to thank God for making me a Yankee." Everything was great then, and everything is lousy now. That's more or less the refrain of baseball old-timers, and though they're probably not right, it must have been far easier to maintain feverish hero worship of baseball players in the days before the Internet and sports talk radio, when sportswriters were content to write the myth, when the cream was what you put in your coffee and the clear was what you were in after passing a couple of box seats to the arresting officer. This boxed set brings together three documentaries about great baseball heroes from another era from the most successful and most frequently reviled franchise in sports, and they're fan letters, really, more than probing looks. Despite its title, Babe Ruth: The Life Behind the Legend is a lot more interested in the legend than the life. Certainly the necessary biographical overview is here—George Herman Ruth grew up in Baltimore, and seemingly single-handedly saved baseball from the dark cloud hovering over the game after the Black Sox scandal. The film, narrated by Liev Schreiber, is really a celebration of Ruth's outsized public persona—the titanic home runs, the epic nights of carousing, the thousands who came out just to see him pass by on a train. It's hard to argue with the premise that Ruth is the most important baseball player of all time—obviously that comes with the caveat that he played in an age when the color line was still rigorously enforced, but still, his home run hitting alone would ensure his legendary status. (He was a thorn in the side of John McGraw, the longtime manager whose trademark smallball style was undone by teams like the Yankees sitting back and waiting for the next Babe moonshot.) The film features lots of great archival footage of the Babe, including his cheesy forays into the motion picture business, and documents his decline as well—once he wasn't well enough to play the game, his life seemed like a largely empty one. Picking up the baton of Yankee greatness shortly thereafter, however, was Joltin' Joe, and Where Have You Gone, Joe Di Maggio? is almost as much about the death of heroism in America as it is about the Yankees centerfielder. The son of Sicilian immigrants, Joe Di Maggio became a great icon, not just for legions of Italian-Americans, but for all of those whose forebears passed through Ellis Island, for anyone whose family came to America looking for a better life. Di Maggio is the link to the first great Yankee dynasty, of the 1920s, for he played with Lou Gehrig. With interviews and clips, the documentary takes us through all the basics—the 56-game hitting streak in 1941, the easy loping around the bases and in center field, the carefully composed public persona. (Unlike Ruth, Di Maggio was an introvert, and didn't work the media in nearly the same way.) His body was punished by his playing days; journalist David Halberstam, whose sections on Di Maggio in his terrific book Summer of '49, provides a good amount of context and information, as do a wide range of interview subjects, including journalist Gay Talese, biographer Joseph Durso, teammates Phil Rizzuto and Yogi Berra, Yale first baseman George H.W. Bush, and minor league prospect Mario Cuomo. Of course there's time devoted to his torturous marriage to Marilyn Monroe, in 1954, and his grieving over her suicide, in 1962; and later, as the game's elder statesman, he kept a keen eye on the bottom line, whether it was shilling for Mr. Coffee or Bowery Bank, or cashing out with signed merchandise he hawked on the Home Shopping Club. There's something a bit unseemly about seeing him this way—and if you've read Richard Ben Cramer's biography, Joe Di Maggio: The Hero's Life, this film seems only to scratch the surface. Still, the image of him playing the game hard, and with stoicism and grace, justifies his presence not only in the American pantheon, but in the lyrics of the Simon and Garfunkel song from which this movie draws its title. 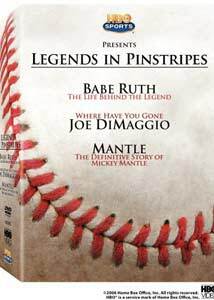 Finally, the tersely titled Mantle is largely a chance for prominent baby boomers to express their undying love for their childhood hero—interview subjects here include Billy Crystal, Richard Lewis, Bob Costas, and Mike Francesa, all of whom seem to get back in touch with their inner children talking about Mickey Mantle, Di Maggio's heir in centerfield. This one, also narrated by Schreiber, follows the same game plan, intercutting new interviews with archival footage, and following Mickey from small-town Oklahoma to the Bronx. The formative influence in his life was his father, who named his son for Tigers catcher Mickey Cochran, and gave his boy a good talking-to after he got down in the dumps when sent down to the minors midway through his rookie year, 1951. (Di Maggio was his teammate that year, and didn't go out of his way to make the youngster feel welcome.) The twin themes here are about Mantle's extraordinary physical gifts, and how he almost went out of his way to destroy them—his career got him to Cooperstown, but how great might he have been if he weren't out carousing and punishing his body with such frequency? Life after the game was unkind to him, too—he was a frequent and surly drunk, and only in his last years, with his body breaking down, did he seem to appreciate what it was he had, and how much of it he squandered. Still, our heroes are with us forever, and the film closes with Costas' eulogy for Mantle, because our legendary figures can never disappoint us in our dreams. Image Transfer Review: These are pretty slapdash transfers, with lots of scratching and discoloration. Mr. Steinbrenner would not approve. Audio Transfer Review: All three discs have English 2.0 tracks; the Spanish tracks on the Ruth and Di Maggio discs are mono, and on the Mantle disc in stereo. They're all pretty full of pop and static, but are sufficiently audible. Extras Review: Only chapter stops, for all three discs. You probably have to look good in pinstripes to love these documentaries, celebrations of #3, #5 and #7, three of the most beloved past tenants in the house that Ruth built.